For this week's assignment I was running a bit behind due to a family wedding weekend in Dallas. I wanted to create something I could see being used with my final project idea of a Meditation Pod. This gave me the idea to create some sort of worry stone or medallion that could become a part of the final project. 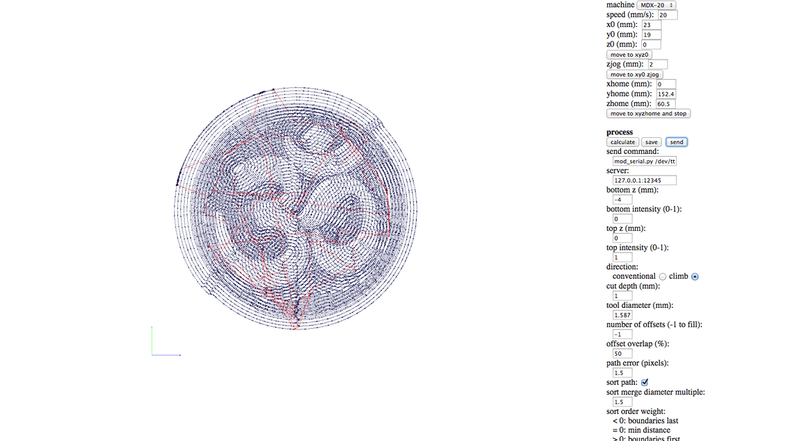 Instead of designing the intricate Hindi script in Rhino, I turned to the internet to find a suitable image. 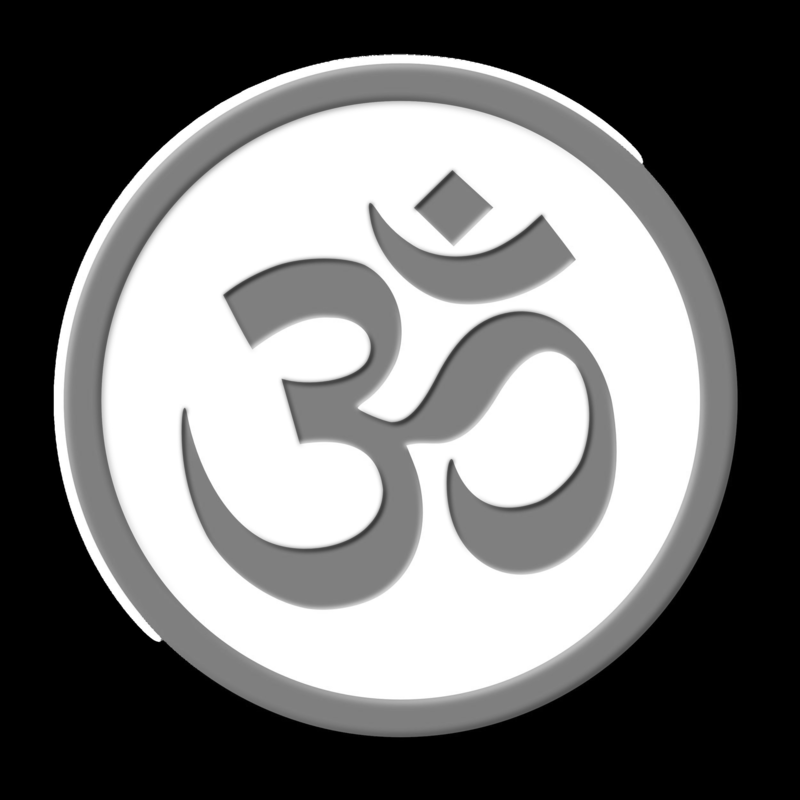 I found a png image of the word OM in Hindi here www.clipartbest.com. From there I had to convert the image into a grayscale that would be able to be milled. To the left you can see the PNG converted into grayscale. Once I imported it into the fabmodules I inverted the image so that the exterior was white and the bottom or the circle was black so that it would cut the correct heights. 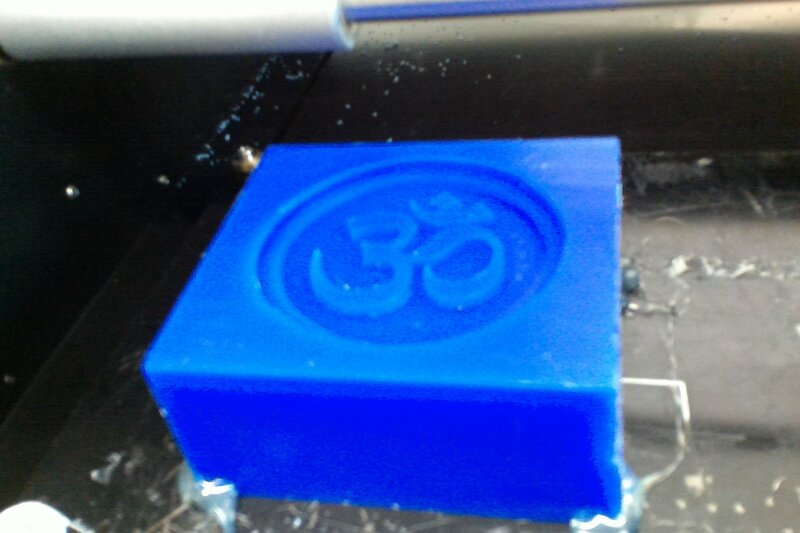 I decided to use the 1/16 bit for my milling as it would pick up some of the finer details in the medallion. As the 1/16 is not a default setting in the fab modules I made the adjustment to the drill diameter in the settings. I also set the z to -4 mm as I did not want my medallion to be too thick. I adjusted the dpi to about 850 in order to get the coin size to the desired 2.5 inches. First I did a rough cut of the image. I did this with the 1/16 with a depth of 4 mms. This took about 43 minutes. The outcome was beautiful. I was impressed by how intricate the detail of the first pass. I messed up a bit on the final cut, however. When I changed the process in the fab modules to final cut I was too quick in hitting send. On my first glance it looked like all of the settings from my rough cut stayed, however, although the x,y, and z coordinated transferred the z min reset to -10 and the drill diameter returned to the 1/8 size. This resulted in the drill going down significantly deeper to start. Luckily I was able to quickly cancel. The 1/16 ultimately did a great job of picking up the fine detail of the hindi lettering. It is hard to tell from the angle of this picture, but I had to do some repairs with clay on the wax mold from when the z min reset to -10 mm. The clay seemed to hold just fine although in retrospect I wished I would have packed it down further, because I think there was a tiny air pocket. 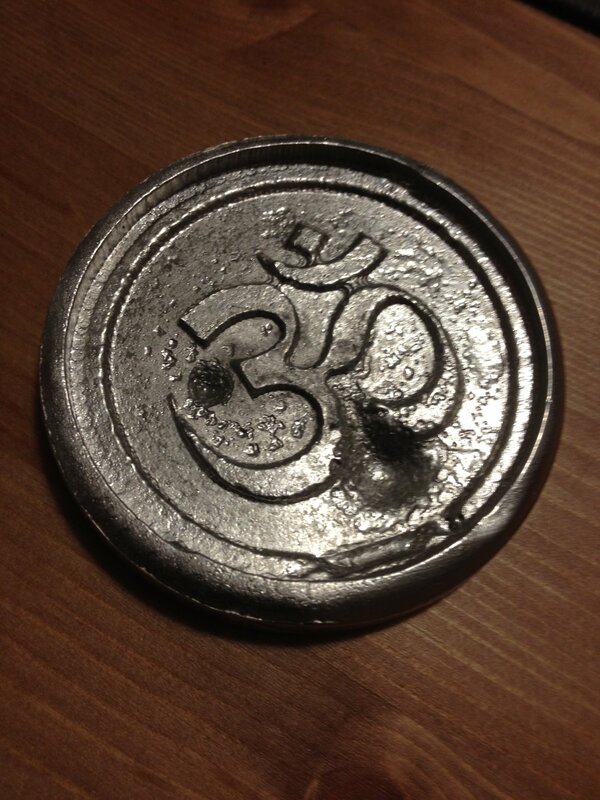 Here you can see the OOMOO mold. There was a slight hole/air pocket from the area with the gash in the wax mold. I think the OOMOO cured well enogh for it to not cause a problem in the casting. I was excited to try casting my mold in metal. In prepartion I lightly dusted my mold with some talcum powder. Then I put an ingot of metal into an oven at 425 degrees. It took about 15 minutes for the ingot to melt. I placed my oomoo mold in a tiny dish that held it perfectly. I poured the metal carefully over the mold in as much of a single stream as I could. I was unable to tap the mold to get air bubbles out and I am wondering if that impacted the final result. After allowing for the metal to cool I unmolded it and found the result you see to your left. I was quite disappointed with the result. 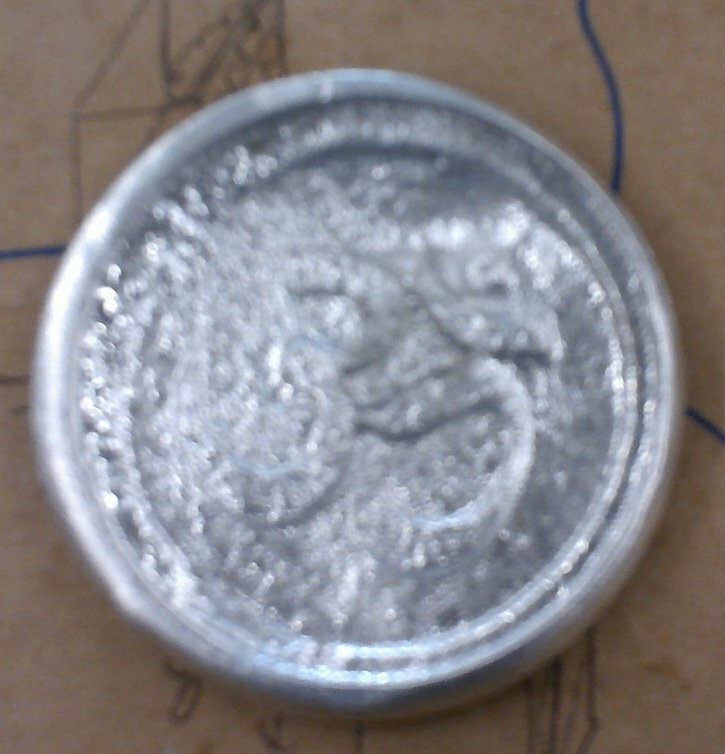 The surface of the medallion had a grainy, rough and uneven texture. There were large bubbles or pockets that resulted in mounds forming in the medallion. I tried the process a second time and got the same result. Third times the charm...well kind of. For the my final attempt in metal I tried to be more attentive to the cooling process. I put on some oven mitts and gently tapped the side of my mold as a simultaneously rotated it. 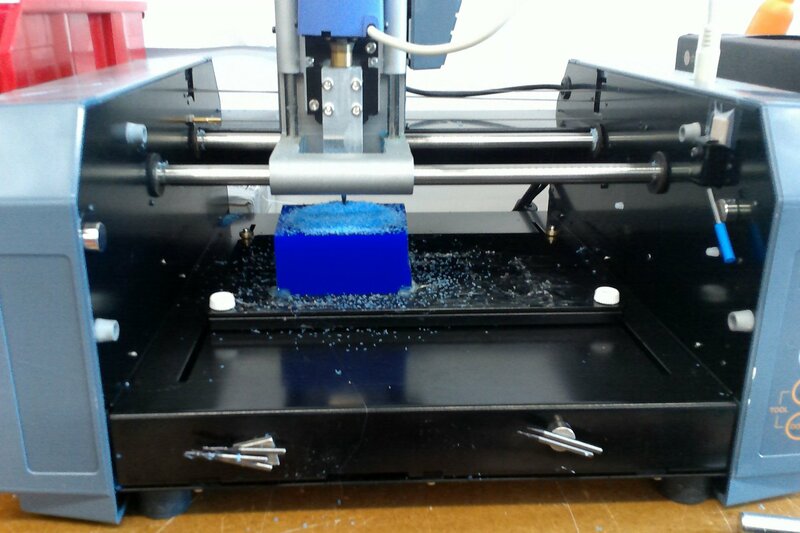 I was hoping that this action would help alleviate some of the larger bubbling I saw with my previous molds. As you can see I did get a medium sized and small sized bubble in this version, however, the overall texture of the medallion was much better than in previous attempts. I think I am going to think of the larger bubble as a rest for my thumb when using the medallion as a worry stone. I was also pretty surprised by the overall weight of the metal, too. For a final attempt I tried to caste in the drystone plaster. 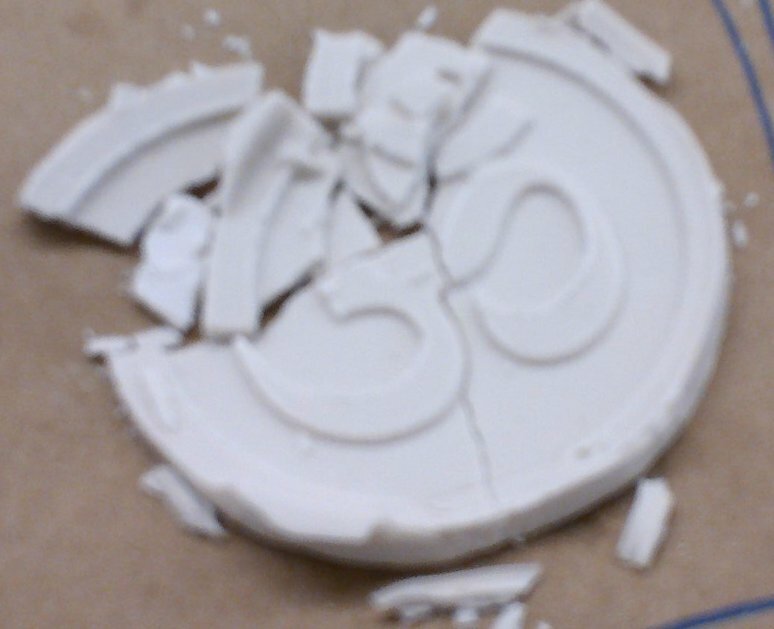 I wanted the medallion to be shallow so I only mixed 100 g of plaster. It took about an hour to dry. 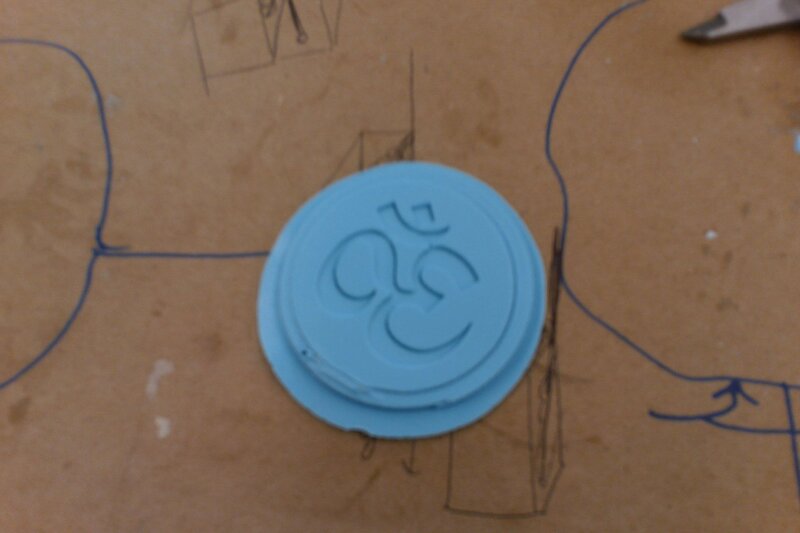 Since my oomoo mold had a bit of an extra lip on it I used clay to create a thin wall around the oomoo to help the medallion form a more circular shape. I poured a very thin layer of plaster and I am not sure if it was a result of that or my impatience which resulted in the cracks you see in the photo.